They said I couldn’t do it. Kansas, Oklahoma and Colorado highpoints starting and ending at the Denver airport; 1400 miles of driving between 3PM on a Saturday and ending with my flight at 4PM on Monday? “No way,” they told me. After knocking off Black Mesa, Oklahoma’s highest point out in its extreme western panhandle, my “hike” of Elbert sort of began. 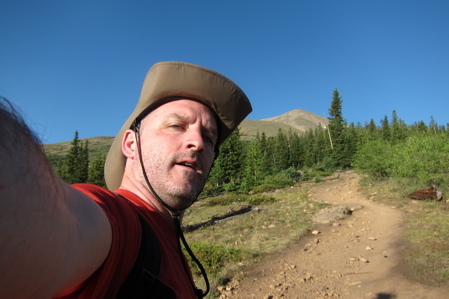 For I had a schedule to keep and a route choice to make to get from Kenton, OK (read: Middle of rolling mesa scrubland oven hot desert nowhere) to Leadville, CO (read: post mining hiker/hippie haven 10+ thousand feet above sea level) in as few hours as possible. The shortest route would take me along about 40 miles of dirt road in northeastern New Mexico, many miles away from civilization. I’m sure I would have made it fine, but I played it safe and stuck to tarmac and what passes for civilization out there. 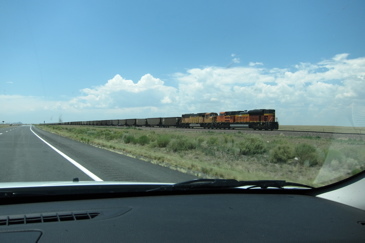 This took me south a bit more than I’d have liked, down to Clayton, NM. It was there that I made the one single driving error on this entire 1400 mile NE-KS-OK-CO highpointing road trip. But look at how they designate their route numbers out there – it’s nuts to try to keep up while driving. My internal compass knew something was off as I headed south instead of west and I didn’t waste too much time. The next several hours were spent trying to replenish lost energy from the boiling hot Oklahoma hike by stopping at wifi restaurants along the way to email Hoang and eat. We passed Walsenburg; suddenly we passed Trinidad where Chad King was somewhere off the road in front of a campfire with perhaps a handful of anthropologists and as of your he too was telling his life story and never dreamed we were passing at that exact moment on the highway, headed for Mexico, telling our own stories. O sad American night! Then we were in New Mexico and passed the rouded rocks of Raton and stopped at a diner, ravingly hungry for hamburgers, some of which we wrapped in a napkin to eat of the border below. It’s just crazy beautiful. Everything is. The mesas, the desert, the mountains, the thunderheads… everything. I can’t do any of it justice, nor would any pictures I could have taken. 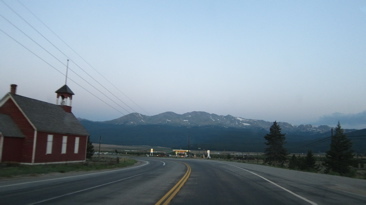 I made it to Leadville by 7 PM – 14 hours after setting off from Sharon Springs, KS that morning. That’s 602 miles, very few of them on Interstate highway and one hundred of them on windy 2 lane mountain roads. Google Maps says it would take a mortal 11 hours and 28 minutes. Throw in the 9 mile, 100+ degree hike back in Oklahoma and I guess I did alright. 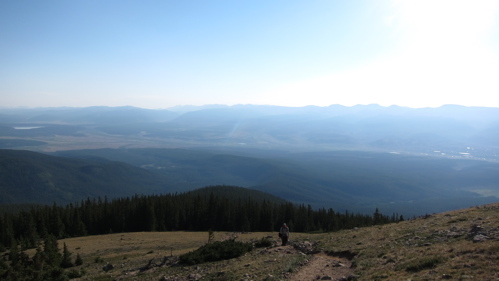 Leadville takes much pride in its elevation. It boasts the highest this and the highest that. I wasn’t too interested in any of it (read my friend Tom’s page about it here), as I had 3 things to get done as efficiently as possible: Call my wife, eat some carbs and get everything set for tomorrow’s assault up the 2nd highest peak in the continental US. Remember how I started this page? Something about people in the highpointing community telling me I was crazy to do what I was doing? When I asked the motel owner if I’d be able to shower quickly after my hike before heading east to the Denver airport, he asked me what time. I said I was hoping to be back by noon. 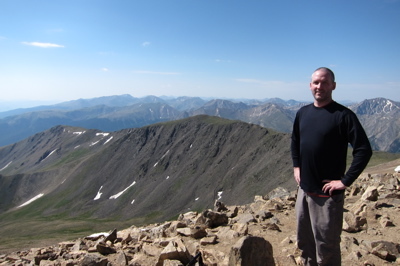 He told me if I climbed Elbert and was back here by noon (with a 50 minute roundtrip drive to the trailhead as well), he’d help me out. His eyes bugged out and he give me the impression that I would not be successful. Annoyingly, my cell phone didn’t get reception and the motel phone didn’t work. Email would have to suffice, though I was missing her terribly. Luckily, the local Italian restaurant hadn’t closed yet and I scarfed down to rather boring but well-made plates of spaghetti. I think the waitress thought I was bulimic or something with how quickly I ate my meal. I went shopping at the local supermarket for some sustenance and got stuck behind an honest-to-goodness Extreme Couponer woman. She annoyed the crap out of me – and the cashier – but I was sort of interested in her ways as quite frankly, we don’t really have her kind in West Hartford. I showered, packed my backpack and all that boring stuff and went to bed by 10:15. 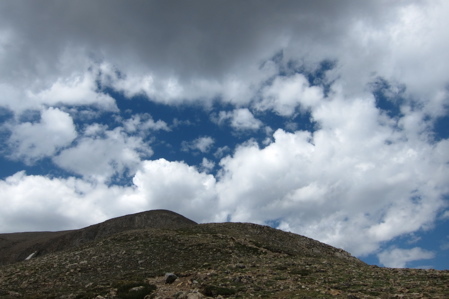 I was happy that I hadn’t felt any effects of the altitude, but did have a rather fitful sleep. I woke up at 5:15, ate some yogurt with a knife (it’s all I had), ate a tired old Colorado bagel (you poor people!) 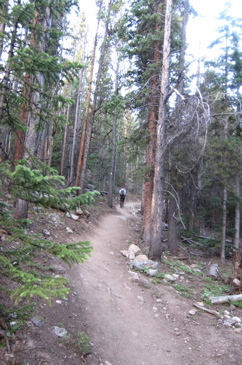 and hit the road down to the trailhead. 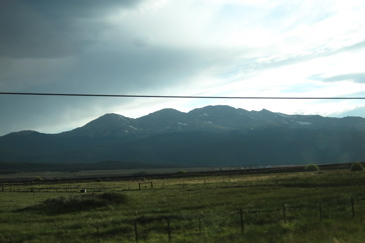 The mountain I had been staring at back in Leadville was Mt. Massive. It’s massive. And steep and somewhat scary looking. 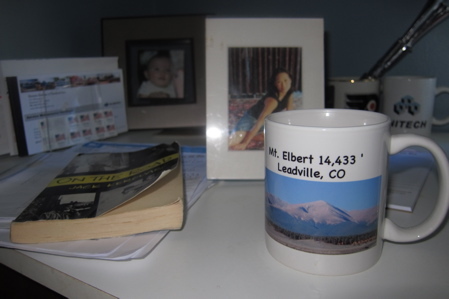 I had read that Elbert was actually a relatively easy climb and in fact, of the 53 “14’ers” (mountains over 14,000 feet in Colorado), it’s one of the easiest with “only” 4,700 feet of elevation gain. I find that pretty ironic. 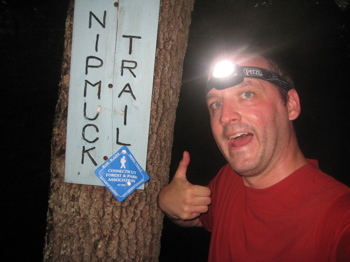 I hit the trail right at 6 AM and felt pretty good. I know my adrenalin was pumping but I was careful to gauge how my head, lungs and stomach felt in light of the altitude. I’ve never felt any effects of altitude before (other than shortness of breath, obviously), but that stuff changes with age and circumstance. I found myself catching up to a very athletic looking guy with high quality hiking gear. He looked like he knew what he was doing yet he was hiking very slowly and steadily. I thought to myself that it would be a good idea to simply follow his lead and stick to his pace. Even though the first mile and a half of the hike is either flat or only gradual sloped, I knew enough to know that going slowly in the beginning would benefit me greatly when it really mattered. This was probably the best decision I made while hiking in a long, long time. 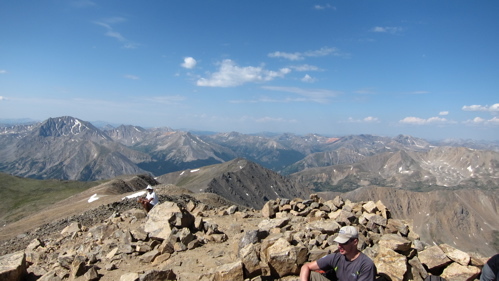 I had a nice conversation with the guy who explained that he was altitude training and his goal on Elbert was to simply have a nice slow day out at altitude. He was forcing every cell in his body to hike “super slow.” After a couple miles, it was plenty fast for me. At one point, I took a bite of one of those dry protein/energy bars while walking and upon swallowing, my throat pretty much seized up. The combination of the bone dry air, shortness of breath and general dehydration teamed up against me. I suffered a rather terrifying 5 seconds when I was truly choking. I guzzled some water and was fine a minute later. My hiking partner said, “Yeah, I never eat while walking at altitude,” then proceeded to keep moving up the mountain without me. Thanks for the tip, dude. Seriously though, it is good advice. 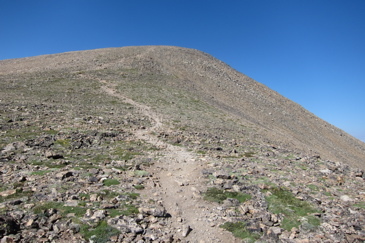 And here’s more good advice: If you are planning a hike up Elbert, you’ve probably read a few accounts already and have noted that when climbed via the route I took (North Elbert Trail from Half Moon Creek) by far the most popular route), you will suffer over a false peak. See that peak? THAT IS NOT THE SUMMIT. 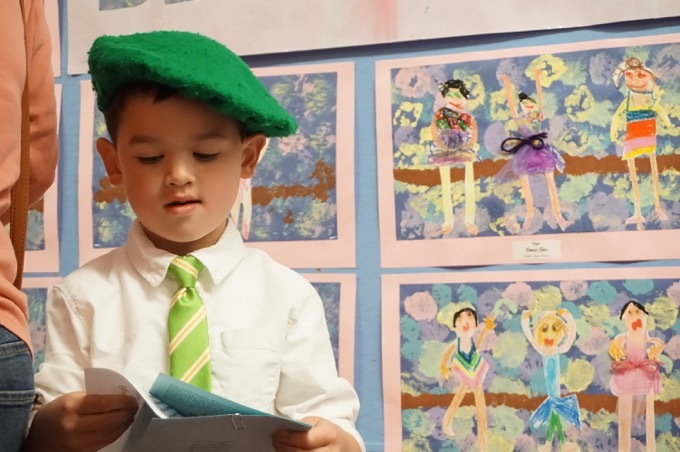 Those trip reports are not lying to you. Read this slowly: YOU WILL SUFFER OVER A FALSE PEAK. 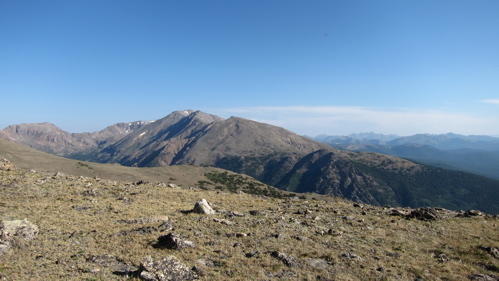 You’re eyes and brain will convince you that the summit you stare at for an hour or more as you climb from tree line is Elbert’s summit. 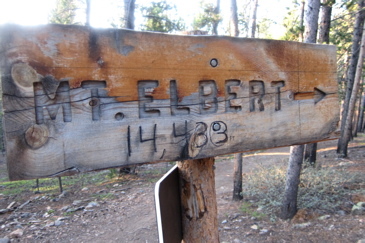 THIS IS NOT ELBERT’S SUMMIT. This is a cruel joke of geology and trail routing. Farther along and I’m not kidding: THAT IS NOT THE SUMMIT. The strangest thing, though, as a group of guys and I sort of formed a loose band as the going got steeper, most of us knew it was a false peak. We’d all read about it. But then there was a couple guys who were incredulous: “No way, that’s got to be the summit.” They were more convincing than the facts the rest of us knew and before I could stop them, groupthink took over and several guys were agreeing! It was sort of surreal. 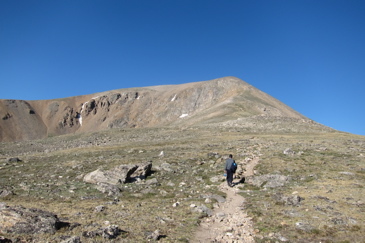 One guy that hiked at my pace and seemed pretty cool was with me though, muttering, “that’s not the summit.” Fist bump. It wasn’t the summit. At about 13,000’, not even all that close. 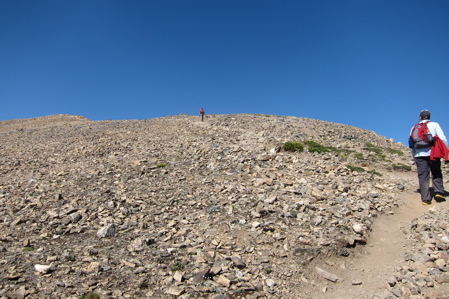 I was one of the first over the hump, which merely revealed a much higher and steeper hump just behind it (a false peak means that you can’t see the true summit while hiking up a lower summit). No matter that I knew it was coming… it’s still a bit crushing to see. 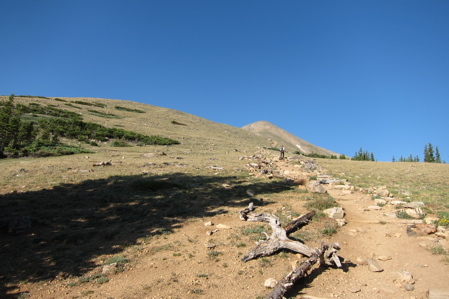 I imagine a vast majority of Elbert hikers reach this point and simply quit. Some of the guys I was loosely hiking with bailed out here. One guy had a flight in Denver an hour before mine and he had been waffling about summiting all the way up. I kept trying to tell him that if he stayed within sight of me, he’d be fine. He just wasn’t believing it – or didn’t feel physically up to it I guess. Some other guy also turned back, but that lunatic had run a marathon in the high-altitude area the day before. People can be very different from me. I took this picture to show my mom that I wouldn’t be alone on Elbert. But I will also use it to illustrate what a big climb attrition rate is like, L to R: Kid from South Carolina hiking with his dad, I think they probably made it but took a LONG time, cool guy from Toronto finished with me, guy that had the flight to catch, did not summit, and the marathoner guy, did not make it. Indeed. The “crux of the route.” This is an unrelenting section that is pretty much a steep 500’ staircase in thin air. Some guys were bounding down as I made my way up and they said, “you are in the hardest part right now. No big deal after this bit.” Cool. They gave me a nice shot of adrenalin that got me up to the “easy” final half mile. At one point, the air suddenly was filled sweet wildflowers that were bursting with color on both sides of the trail. Wow. 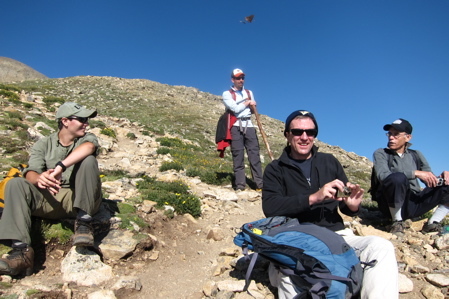 I was at or near 14,000 feet and in a beautiful natural garden. 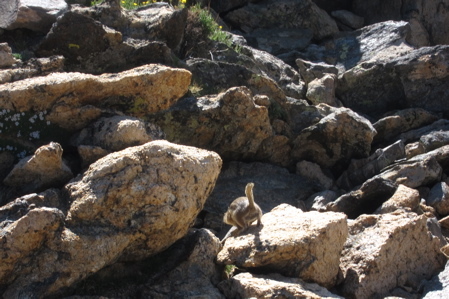 I also saw what appeared to be a very lost, very injured bird scuttling about 20 feet off the trail. I was later told it was a grouse of some sort (blue or dusky) and that they are really dumb birds. As in, I could have walked up to it and kicked it and then repeated the action. I didn’t try it, but if that’s true, that’s a pretty dumb bird. And really, what was it eating up there? Before I could spend too much energy thinking about that, I made it to the summit. Several people were resting up there, most having come up a different trail. I checked my watch and turned tail and started to head down – before getting yelled at by 3 people. I was only half-kidding and I did relax for a few minutes to take some pictures and try to eat some food. The summit offers incredible 360-degree views of the surrounding mountains. There was almost no snow anywhere and residents were telling me that this was the first time they can ever remember not seeing hardly any snow at altitude. I didn’t stay on top for more than 10 minutes. Even without a flight to catch or a motel owner to prove wrong, I probably wouldn’t have stuck around too long. It was exactly 10 AM when I hit the summit (4 hour climb) and my goal was to get back down in 95 minutes. So that’s exactly what I did AND got back to the motel by noon AND was allowed to change and clean up before driving to the airport AND spend $15 on a dumb coffee mug of the mountain. 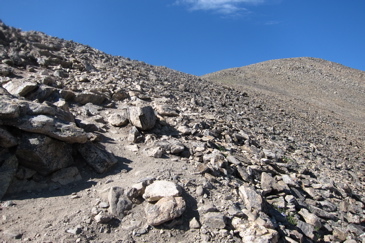 As I descended (quite rapidly), I passed many, many people hiking up. Those folks within half an hour or so of the false summit were going to make it for the most part. Pretty much everyone else below them? No way. In the Rockies, rain and thunderclouds appear right around 11 AM and only get worse through the afternoon. So far, all my pictures have been beautiful and cloudless, right? Not only that, I was again struck by how dopey some people are when hiking. I saw a young woman with a single 12 oz water bottle. Many others were in jeans or sweatpants. Even in Colorado, people are dumb. And that was that. A conference in Denver got me out here and I used my time wisely to nab the highpoints of NE, KS, OK and CO. It’s kind of crazy to realize that Mt. 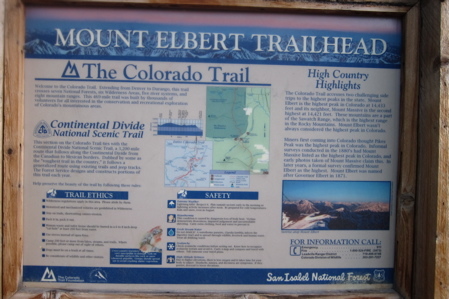 Elbert is only 62 feet less than Mt. 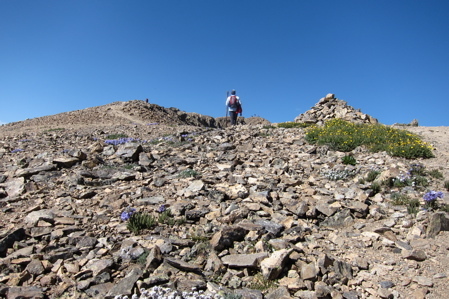 Whitney in CA, the highest peak in the continental US – but which requires a much longer hike. 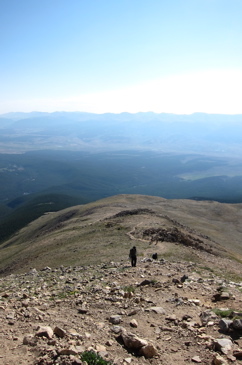 I was up and down Elbert in under 6 hours and I’m not in particularly good shape or all that young anymore. The drive to the airport included gorgeous scenery north through the Rockies and then the famous super long descent down I-70 to Denver. I’m talking 50 miles of downhill; it’s nuts. 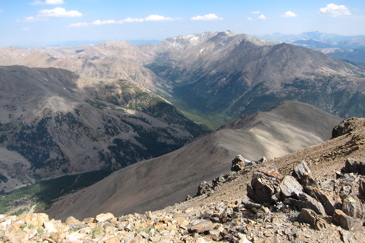 you have now officially hiked more 14ers than i have. and i live here. congrats.